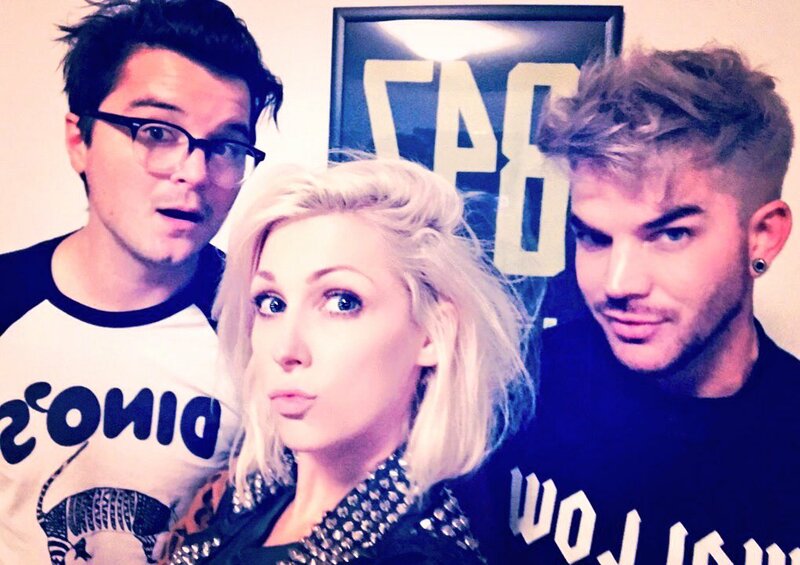 According to news blog Hamada Mania, Adam Lambert is working again with Bonnie McKee and adding Tommy English on his fourth album. This is backed up by tweets from McKee and video from Adam. The best news is we can look for this album later this year! This is very exciting news for Glamberts and world-wide fans. I can only wonder if Max Martin and Shellback will be involved on this project? Without jumping to any conclusions, it could just be a schedule conflict or a desire to change things up. But I can’t help going to the dark side speculating could the lack of radio play for The Original High (other than Ghost Town) have any basis? Taken from Hamada Mania, “McKee previously co-wrote “Cuckoo” and “Chokehold” for Lambert alongside regular collaborators Josh Abraham and Oliver “Oligee” Goldstein. Both tracks appear on Lambert’s sophomore studio collection, 2012’s “Trespassing,” which topped to the US Billboard 200 Albums Chart. I’m very encouraged to see these creative artists working with Adam! I love BØRNS (“Electric Love”) and New Politics is one of my favorite groups. Also noted for this album is Adam’s friend Ferras Al-Qaisi, who has written for Ricky Martin and Idina Menzel, among others. What do you all think? Just looking forward to another album. I just wish he could have one or two hit songs. He deserves it. Ghost Town was/is a huge hit selling extremely well internationally. It’s always up to label whether or not they are willing to promote an album or songs. What do I think? I CAN’T WAIT!!!!!!!!!!!!!!!!!!!! I hope and pray that he can find a niche and a song that gets him better airplay. He deserves a few hits. I get frustrated when I hear “Live Like We’re Dying” on my office Muzak nearly every day but I never hear Adam played anywhere. Even stations like Velvet on Sirius XM will pay him very rarely, but will play the hell out of Christina Grimmie and Tessaanne Chin. I fail to understand how radio and steaming works. Why some artists get played to death and others don’t. Sorry for the rant. Just wishing and hoping and praying for mainstream success for Adam. Best news I have heard this year! Soooo exciting…I can’t wait! Yahhhh. Hoping this time around there is a song or two that gets some decent radio play! We need to get Adam’s name front & center to bring on more loving Glamberts to support his genius! Thank-You Carol as usual for the new information on Adam. It’s great to hear he’s working on something new. Hope it’s something with staying power! I have one extra ticket for the Queen/Adam concert on Wed July 26 at Prudential Center in Newark NJ. Seat location is in FIRST ROW of Sec 227 (technically Row 2 but there is no Row 1 so this is really the first row of that section), seat 8. It’s side seating but vision is good, plus they always use a long catwalk. Cost is what I paid – $69.50 + $17 service fee. I’ve never sold tkts before so am unsure how to proceed. I DON’T WANT EVERY ADAM FAN TO KNOW THIS EMAIL. Replies should go to eayervais@gmail.com. Thanks for your help.